It's just impossible to keep up with the rate at which Nintendo Switch games are being released. I'm doing my best, but when over a dozen are landing on the console every week, taken as both ports from other platforms, and all-new games, trying to play and review them all is an absolute exercise in futility. Many of the games being released on Switch I've either reviewed previously, and haven't really got much more to add to those existing reviews, or are games that aren't in themselves worth the full and in-depth review treatment. So, just for something a little different, I'm going to do short 'n sweet reviews for a couple of the more notable recent releases on the console. Read my full review of the PlayStation 4 release here. 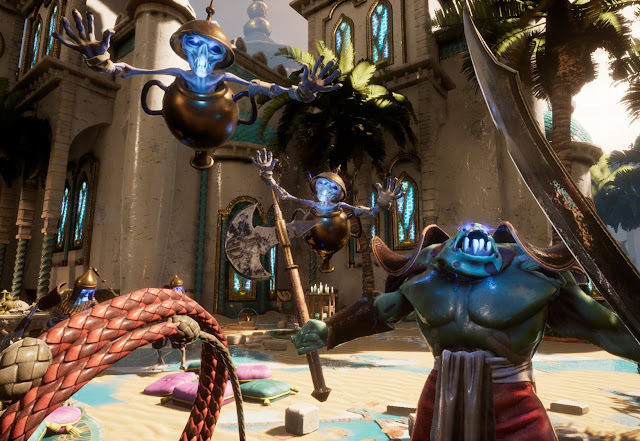 City of Brass is my favourite FPS roguelike, by a significant margin. Developed by Australia's own Uppercut Games, the game's already been released on other consoles and PC, but jumping into the Switch version after a while since my last play just shows how much on-going development has been going into this game. City of Brass has so much more than it did, even a year ago. There are many more new enemies to take on, and new weapons and other treasures to help take you through the deadly Arabian Nights-themed levels. 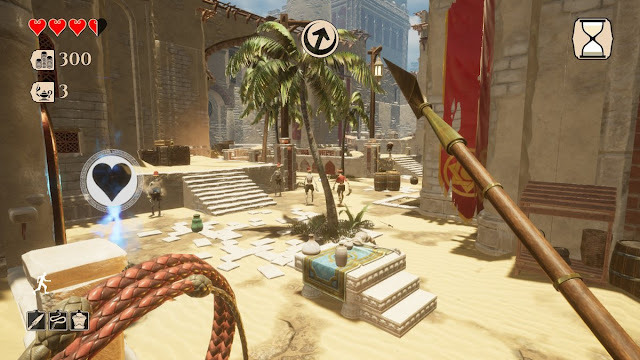 There are also new character classes to enjoy, and with each of these new additions Uppercut Games has balanced them perfectly to ensure that the game remains genuinely challenging, varied, and ultimately, interesting. The Switch version runs gorgeously, too. City of Brass was always a good looking game, in that it got the thematic tone of the Arabian Nights down just right. On the small screen of the Switch, the sandy environments and various monsters all fill the screen with colour and wonder, and because levels are relatively short and too the point (and have a fairly strict time limit), this is an ideal game for pick-up-and play, too. My only issue with City of Brass is that I'm left absolutely aching for more context. There's virtually no narrative in the game, and while you can add your own backstory if you've already read Arabian Nights and understand what the city of Brass is, Uppercut Games' vision is just so rich and vibrant that I just wish the team had a story to share as well. Perhaps we'll get that with a sequel or another game in the same setting down the track. Read our review of the original release of the game here. The first outing for Arc System Works' brilliant BlazBlue fighting game series on the Switch is a really, really good one. Including all the DLC from the original console release, Centralfiction has a huge roster, some of the most eye-catching and richly detailed backgrounds and, of course, very flashy action. A person's taste in fighting games is perhaps even more varied and subjective than in any other genre, but what I love about BlazBlue is just how spectacular the combat is once you've played around with it for a while. When selecting a character you can choose whether they'll fight "technically" or "stylishly," with "stylish" being something of an easy mode that allows you to get off special attacks and big combos easily. You'll want to move to "technical" eventually for the greater sense of control that it offers, but regardless of how you play, flashy, fast, fluid and explosive action is the name of the game, and it simply feels great. The other side of BlazBlue that I've always enjoyed is the narrative. Fighting games are better known for having stories that hover somewhere between the silly and the ridiculous, but BlazBlue has a deep story to tell... almost too deep. If you haven't played a BlazBlue game in the past, you can look forward to a half hour recap of previous events - yes, really, a full 30 minutes to catch you up. From there, a wildly spinning science fiction story will take you through many chapters of visual novel-style storytelling, with a fight scene every hour or so to remind you that you are indeed playing a fighting game. It's a surprisingly decent narrative, mind you. BlazBlue has all the typical tropes of youth action anime, with its focus on moving up and down power rankings something overly familiar to anyone who's watched even a few anime titles in the past. But, again, BlazBlue does it convincingly enough that you feel like you're getting a full anime season as part of the game's entry price. Throw in the quality competitive seen, umpteen different alternative gameplay modes, and the sheer size of the roster, all available from the outset, and BlazBlue is going to be hard to put down for a long period of time. Read our review of the very first Kairosoft title, Game Dev Story, here. Kairosoft is the kind of developer/publisher that gets away with doing things that you wouldn't let other game makers get away with. While each one of the teams' games is only marginally different from the others, and Hot Springs Story is a reskin of Venture Towns which is a reskin of Mega Mall Story, which in turn is a reskin of Pocket Academy, it's hard not to love every one of them, because the core gameplay is so clever, and the characters and design so cheerfully charming. I hate using the word "addictive" as a way to positively describe games (addiction is dangerous and bad, yo), but it really is hard to put Pocket Academy down once you start playing. Your task this time around is to take a tiny, single classroom school, and turn it into a thriving centre for excellence. You do that by hiring and training teachers, improving on your cirriculum, and constructing facilities that range from bathroom blocks to farmland to sports fields. What really sells Pocket Academy is the students themselves. As the reputation of the school improves, more students will come and learn, and they'll form little friendships and romances, and then wander around the halls together. Other kids will change into slacks and run up and down the hall on all fours with a polishing rag - an amusing little thing that actually happens at Japanese schools, just to remind you where Kairosoft comes from. 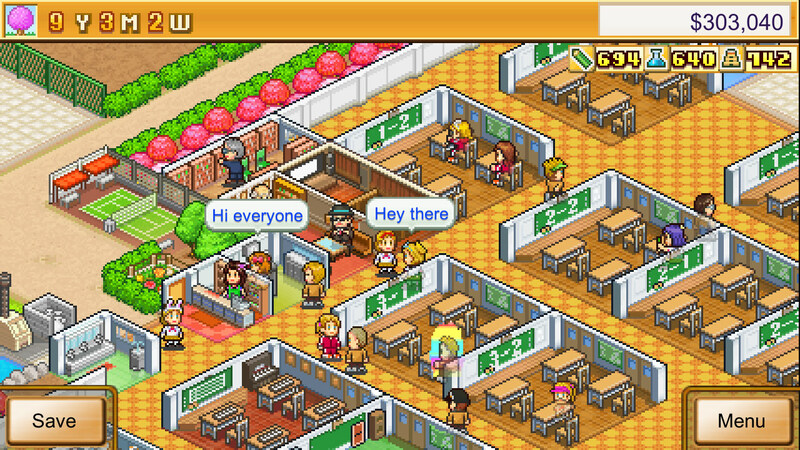 To criticise Pocket Academy; things tend to happen more slowly than in some of Kairosoft's other titles. You unlock new buildings and facilities more slowly, and run out of cash more quickly. Time also ticks by at a slower rate. The most directly comparable Kairosoft title, Hot Springs Story, is much more sprightly, and therefore the superior place to start if you're looking for just one Kairosoft sim for your Switch. 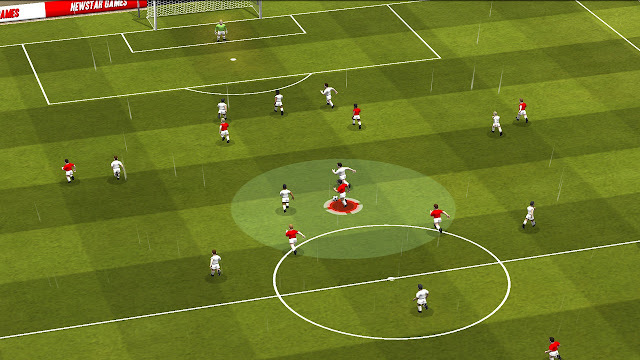 Read our review of a good football management simulation here. When I think about what I want in a sports management game, it's surely depth. I'm willing to put up with shoddy production values and a cluttered, clumsy interface, as long as the underlying game is deep and complex; something I can spend dozens upon dozens of hours playing, trying to carefully manage a team through the ranks. A sports management game needs statistics layered on statistics, and menu screens layered on menu screens. New Star Manager is the precise opposite of what I want in a sports management game. It's simplified to a lobotomised degree, and structured just like you'd expect for a free to play title (except that it costs money upfront on Switch). You've got packs of "cards" that you earn through play which let you improve a handful of different skills on the players. Occasionally you'll also get a really good player, or you can trade for better players using cash earned after each match. It all works, but it's painfully shallow stuff, and the only things you really need to manage is the stamina of your players, which doesn't return to full between matches (though you have so many "energy drinks" that restore stamina that you'll never have to worry there). The one point of difference between New Star Manager and a proper management game is that you do get involved in the on-field action, to an extent. At critical moments in a match you'll take control of players in a turn-based minigame, where you control where the ball is passed around, and when and where the shots come from. While it's a somewhat neat idea, it has the effect of making the statistics and management of your team less relevant, because there's an element in the on-field action that means you can make frequent horrible decisions and mistakes and still win. So with New Star Manager you get poor on-field football action, and poor off-field management. Throw in the cheap "typical mobile game" aesthetics and design, and it's hard to understand who would want to play this. People who simply like football would go for FIFA. People who want a management simulator would go for the densely rewarding Football Manager. Both of which are already available on Switch.